We are leading Vibration Screens, manufacturers, suppliers and exporters located in Ambarnath MIDC Dist Thane, Maharshtra India. Mitool Make Linear motion rectangular vibrating screens are rugged & designed for long life. Mitool selects & delivers the most efficient & economical vibrating screen for individual application. Screening performance is affected by various characteristic of feed material including particle size shape, Bulk density, flow ability, moisture , methods of loading etc. Most important is the particle size distribution of the feed material. 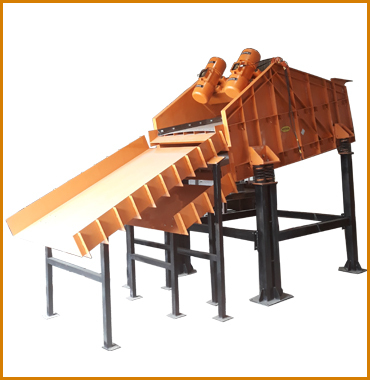 Mitool Make Linear motion rectangular vibrating screens are operated by a two unbalance motors which produces liner vibrations. Linear motion screens are very high performance machines, in terns of capacity & efficiency. They have a low inclination which varies between 0-15 degree down slope. Mitool vibratory screen are supported by suitable springs which isolate the vibration. Mitool also make grizzly bar vibrating screens to extract coarse material from storage bins or storage hoppers & convey it to downstream crushers.